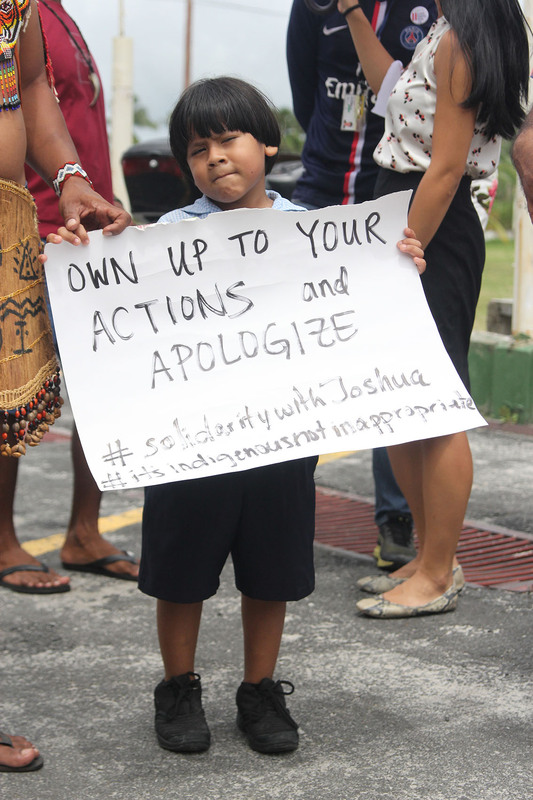 The Education and Social Cohesion ministries have launched a joint probe into the alleged discrimination against a Mae’s Schools pupil over his indigenous wear, even as the school faced another protest yesterday calling for it to apologise. 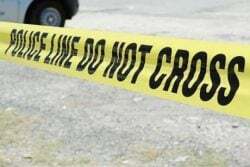 It was the first protest since the school released a statement on Tuesday disputing reports in the media about the circumstances of the case. But those gathered yesterday were less than satisfied with the school’s response, and noted that what they are seeking is nothing short of an apology. “I think it was ludicrous; it’s a clear-cut lie. Had the school believed its own lie, that statement would have been forthcoming since Friday. 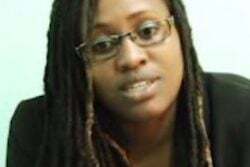 But you took [four] days to come up with something that vague, it’s a clear-cut lie…,” Erika Tularam, one of the coordinators of the protest, stated yesterday. 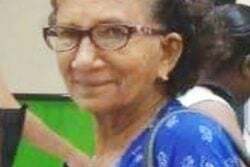 Several persons questioned the pervasive silence of the relevant agencies on the matter, and specifically the Ministry of Indigenous Peoples Affairs, the Ministry of Education and the Ministry of Social Cohesion. 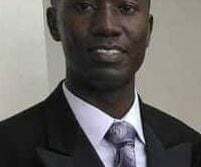 Public Relations Officer of the Ministry of Education Brushell Blackman told Stabroek News yesterday that the ministry has launched a joint probe along with the Ministry of Social Cohesion. 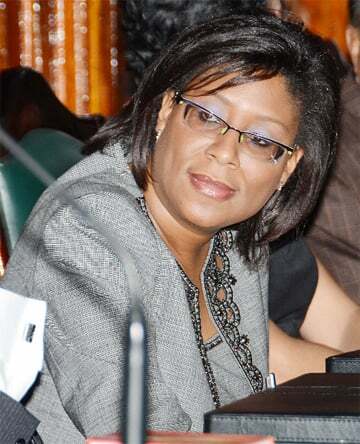 However, despite Junior Indigenous Affairs Minister Valerie-Garrido-Lowe formally commenting on the matter during a televised programme, and the Education and Social Cohesion ministries reportedly investigating the matter, none of the aforementioned ministries have released a formal statement. “…Why aren’t they saying anything? Why aren’t they outrightly condemning this act by Mae’s? We’re just the only ones who are standing up for ourselves and that’s why we’re here but we will continue, we will keep the pressure on because we deserve better. We deserve respect and an apology and that’s what we’re fighting for,” Natasha Smith, another organizer, stated. 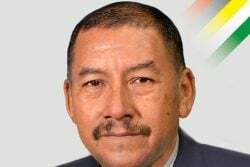 PPP/C Member of Parliament Nigel Dharamlall, who functioned in the capacity of Permanent Secretary of the Ministry of Amerindian Affairs under the former administration, also attended the protest yesterday. 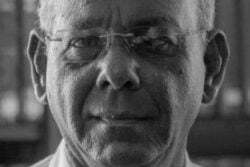 He called the actions of the school “unwarranted” and “disrespectful to indigenous culture, while noting that the rights of indigenous people are protected under the Amerindian Act of 2006. “I’m gonna say that the politicians and those who are silent, such as the Ethnic Relations Commission, the Ministry of Social Cohesion, the Human Rights Commission…there’s a saying, silence is consent. 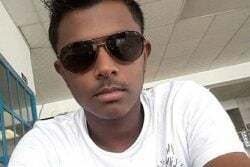 They’re being silent, they have nothing to say and they’re going to be sorry for saying nothing on this issue…,” Colin Klautky, a member of the Guyanese Organisation of Indigenous Peoples (GOIP) stated yesterday. 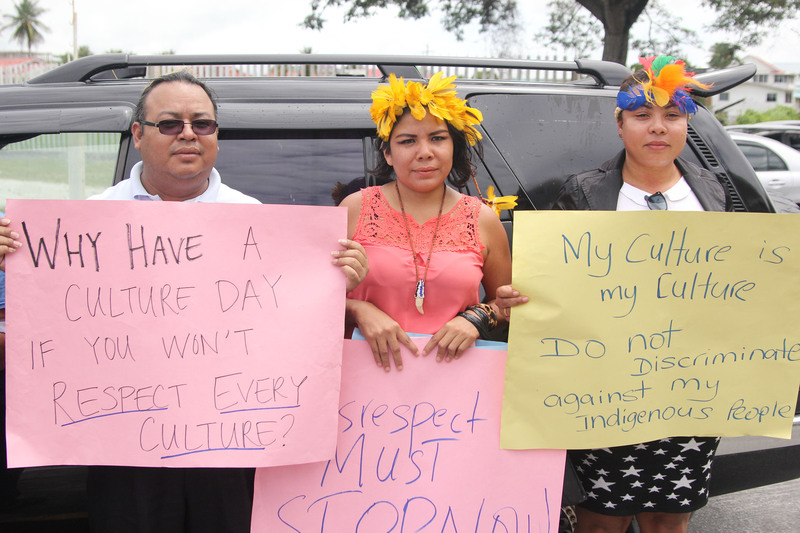 “…This is the latest in a string of abuses against indigenous Guyanese. This one has been reported. There have been lots of unreported ones. 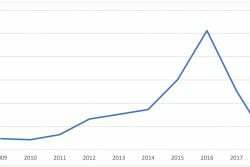 Indigenous Guyanese are rising. 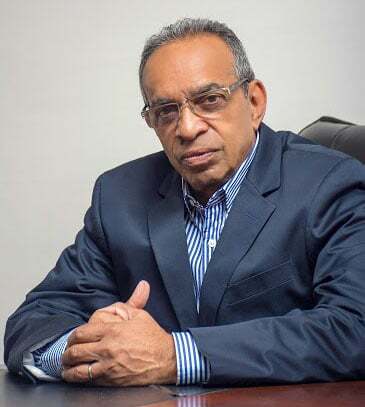 We are becoming educated people, we are becoming powerful people, and should we hold one head, I hate to refer to Guyana’s nasty politics, but should we hold one head and decide to swing the vote in either direction… we’re gonna get the last laugh,” Klautky warned. “Should they not give a proper apology—we do not consider that balderdash that was issued [Tuesday] as an apology—well this protest seems like we’re gonna have to continue,” he added. 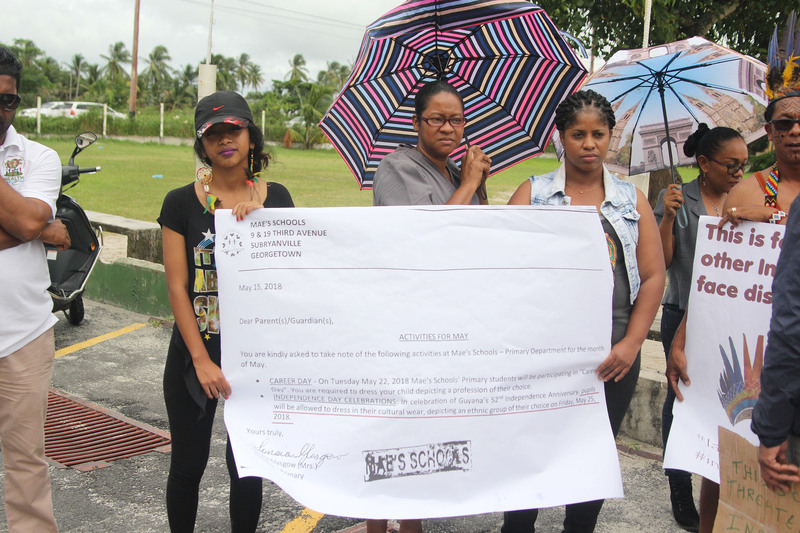 The Mae’s Schools, in its official statement, cited the country’s lack of a policy governing exposure of children as one of the challenges in dealing with the issue. “Are we sexualising a little child? 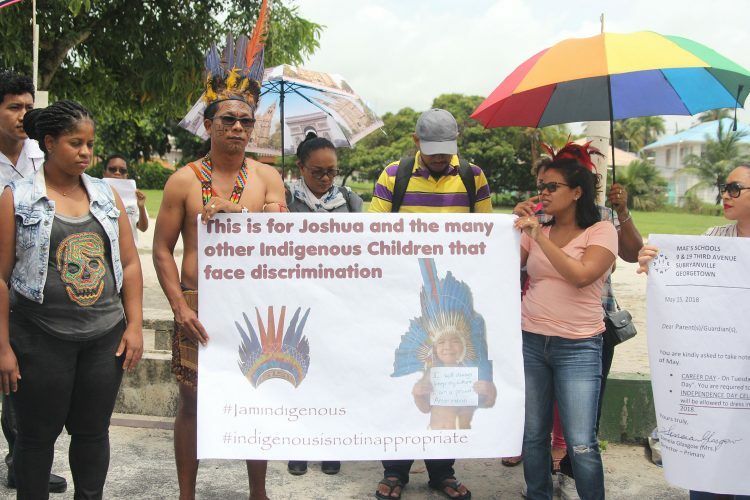 That’s the question I wanna ask the school…if you go to indigenous communities or wherever indigenous culture is displayed and you see some little kids, would you feel that they’re inappropriate because that’s the way they’re dressed? That’s their culture, that’s our culture, so why should it be offensive to anybody else?” Smith questioned. Another protestor, Merrano Isaacs, sharing Smith’s sentiment. “People tend to jump on and oh, they so proud…and in September they’re very proud to say, ‘Oh, my great grandmother was Amerindian’ and so, but don’t use it conveniently. If you’re proud of the indigenous tradition, be proud of it and don’t use it for convenience… These things—cassava bread, piwari, farine and so— are what the indigenous people use every single day. And maybe in terms of the dress they don’t, but you go into any of the villages, the children play and run around with next to nothing sometimes because of the heat,” he pointed out. 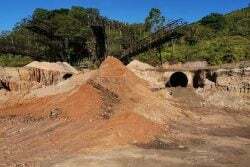 Michael McGarrell, of the Amerindian Peoples Association (APA), said that while he could understand a need for policies to deal with such issues as decent and indecent exposure, indigenous heritage cannot be bound by policy. “…This is our culture we’re talking about. Our culture should never be governed by a policy. I mean, if you want to talk about a policy in terms of exposure, then maybe deal with it with carnival and Mashramani…if you want to talk about a policy for exposure then deal with those things, not with our culture. Our culture is ours and it’s not one to be messed with, it’s not one to play with. You can’t put restrictions on our culture,” he asserted. McGarrell reiterated the need for sensitisation sessions on indigenous culture to be held within the school, not only for the students but for teachers as well. He noted that the APA had planned to meet with the administration to discuss the way forward, but related that that meeting had been postponed by the school. However, in the meantime, McGarrell, like the others, awaits some show of remorse from the administration. “We’re expecting nothing less than an apology from Mae’s. I think their release was just basically adding insult to injury and it’s not one that we can accept. As someone who proclaims to be promoting social cohesion, the release in itself does not actually do that…because what it did was that it was blaming other children for example, for humiliating that child, which is not true,” he said. “Mae’s could have used this as a teaching experience…I think they failed to do that and as an institution that says they’re one of the premier institutions, they should know better and teachers should know better working at the school that hear what, every opportunity is a learning opportunity and we can teach children. So, I think they failed in that regard and they failed in properly addressing the issue in their release,” he added. Small related that in spite of her initial desire to remove her son from the school, he remains there in the meantime, per his request. “How do you tell a child not to go when all his life you told him to stand up for what he believes in and to embrace? Now if you say don’t go to school because of this, then what are you telling them? So I supported him and I said well if this is what you want,” Small stated, relating that he has had no problems since his return to school, from his peers or teacher, who has been supportive. 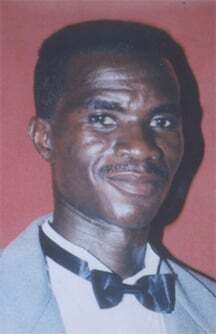 The family is still to determine their way forward on the matter.